The receipt from the hardware store denotes $4.04 for one poplar 7/8″ dowel rod. That doesn’t seem like much, but yesterday with the help of two of my daughters, we turned that into a memory. 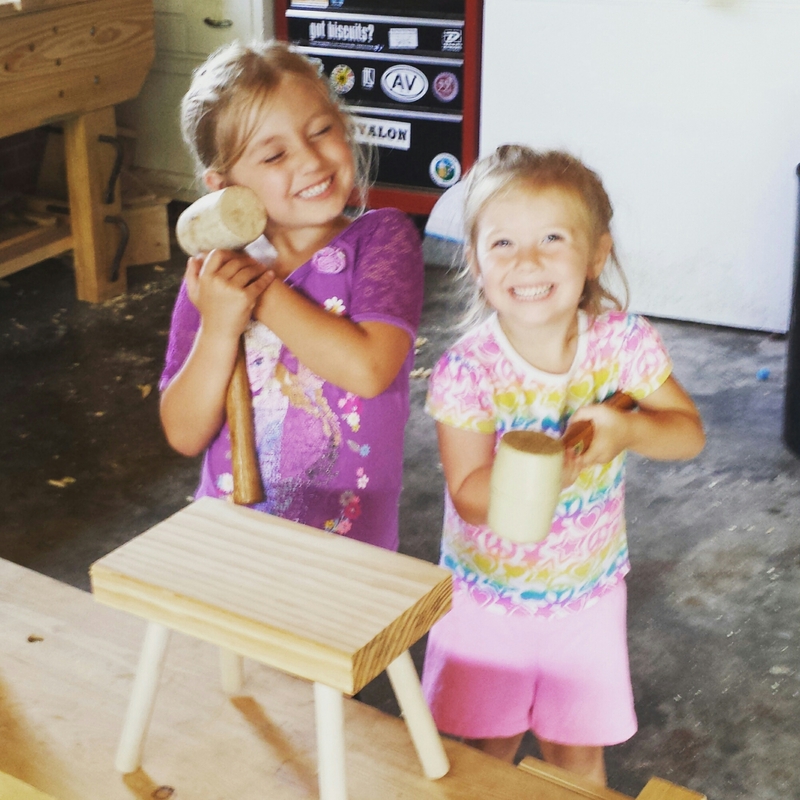 One of the things that I love about working with hand tools is that whenever I am out in the shop, my daughters are usually not far away. Generally, they’re riding bikes or decorating the floor with sidewalk chalk, but every once in a while they take an interest in what I’m doing. 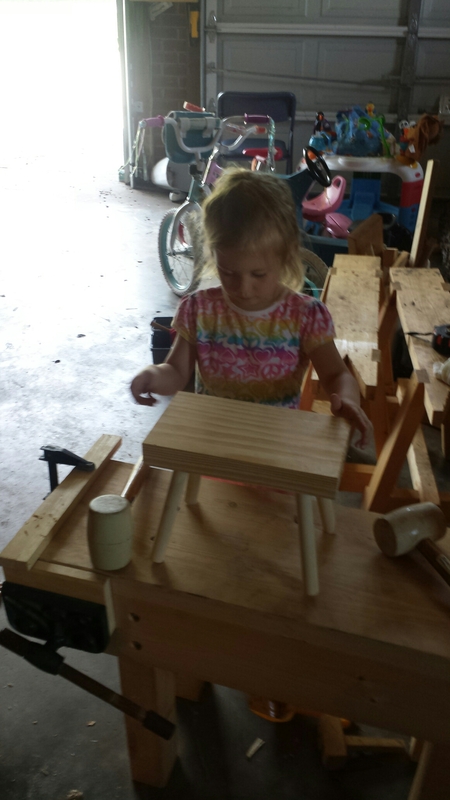 I’ve noticed my 3 year old working at her bench from time to time driving nails into scrap wood, and I asked her what she was making. 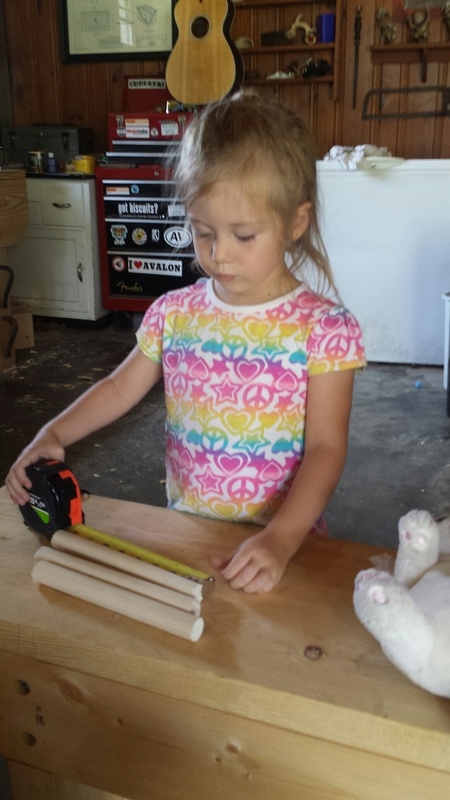 She held up a dowel rod and told me that she wanted to make it into legs for a table and she wanted my help. That was enough to make me drop whatever I was doing and start formulating a plan. I looked through the scrap wood and found a Southern Yellow Pine off-cut from my workbench that seemed like a good size for a little table. I cut it to length and squared it up. 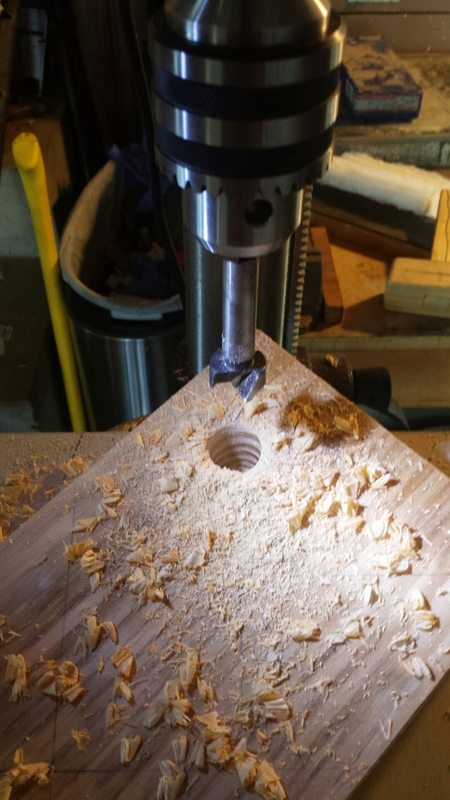 Having recently completed the staked desk I’ve been building (more on that later) I already had the drill press set up with a jig to make leg mortises so I swapped out the 2″ Forstner bit for a 7/8″. One trip to the store and a few sight lines later and we were ready to build a table. By this time, my oldest daughter wanted in on the action, and although I knew that the layout was a bit beyond them, I wanted to involve them in everything else. 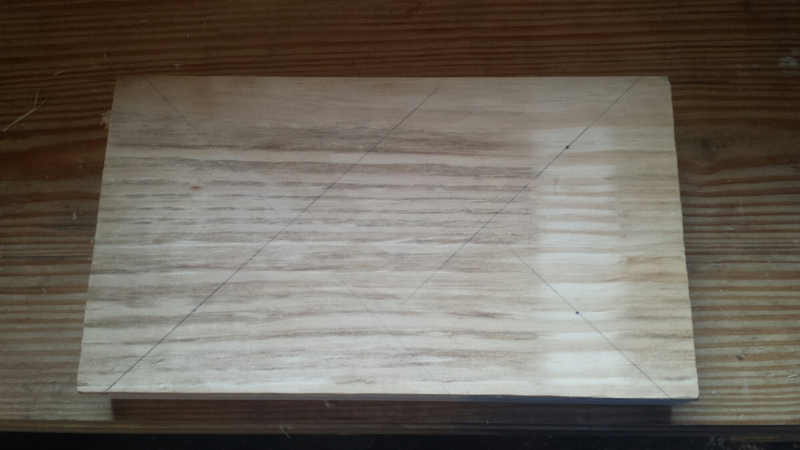 The jig was already set up for a 16 degree resultant angle, so I did some layout on the top locating the mortises such that the bottoms of the legs would be just under the corners in plan view and drew 45 degree sight lines. At that point, all we needed were legs and mortises. I let them measure and mark the legs (just slightly overlong) and then helped them cut them out. 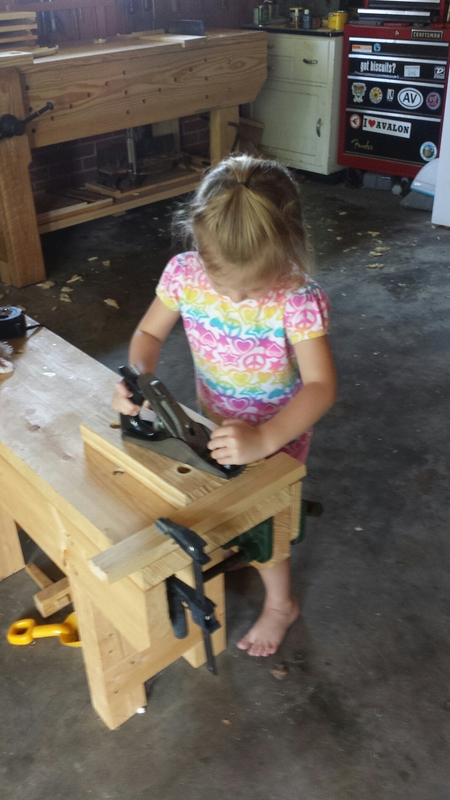 My oldest (at four years old) is actually getting pretty good with a handsaw. 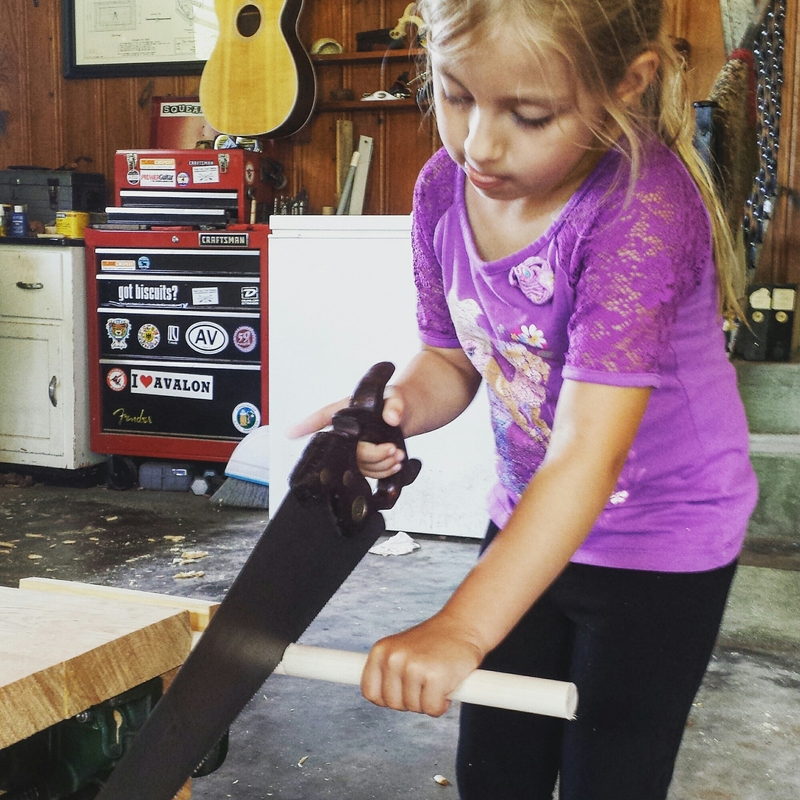 She’s got a decent grip and every time she starts a cut I hear her say “light, like a baby bird” which is how I taught her to hold the saw handle. After cutting the legs I quickly shot the ends with my no.6 and we were off to the presses, err, press. After locating and securely clamping the work to the jig I let them flip the switch and help drill the holes. I thought this would be the highlight of the project, but I had no idea how much fun dead blow mallets would be. 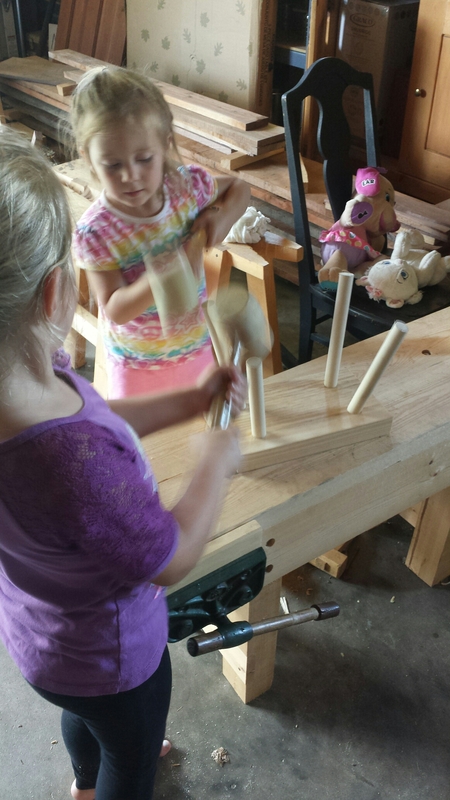 With all the holes drilled they got to clean up the top a little with their smoothing plane before spreading glue in the holes and knocking the legs home with the mallets. Without a picture I couldn’t possibly explain the joy of this moment. 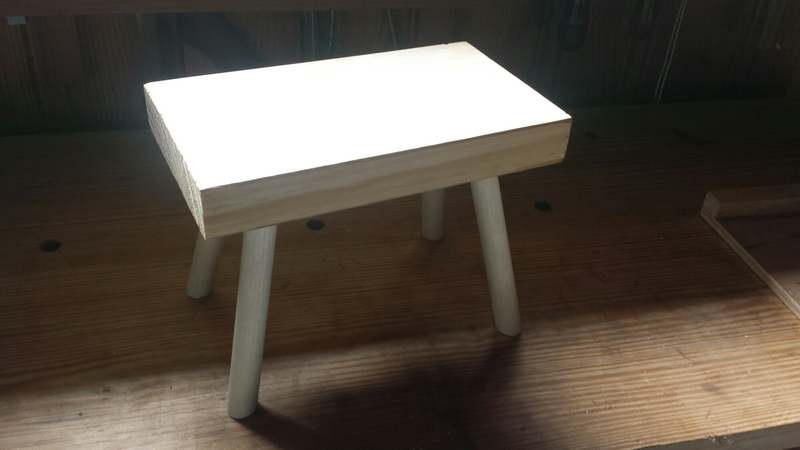 This morning I leveled the legs for them, and what’s left is a pretty respectable little stool. I feel obliged to say that although now such a design seems so obvious for a project like this I never would have thought of it before reading ‘The Anarchist’s Design Book’ and considering the possibilities of staked furniture. I may just make a few of these in oak as step stools. THis made my day. Thanks Jim. We’ve been working on similar stuff over at the Nichols house. Awesome. I can’t wait to see the next generation of makers grow up! Great post! Makes me want to find a spot to put a bench in the new shop for my 3 year old. Awesome. I need to get my son in the shop. He’s about old enough. 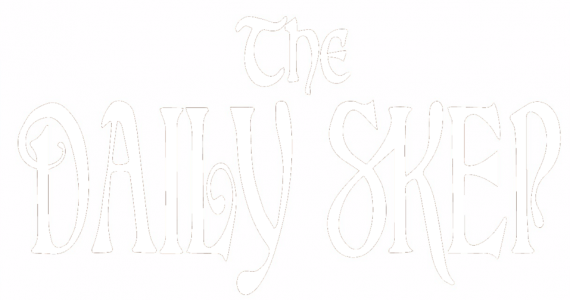 …when the kids come along with a “…just want to…”, then workshop time ends up in kind of a family meeting. Good time then – and sometime stressful for me to find a proper job for everyone to do :-). 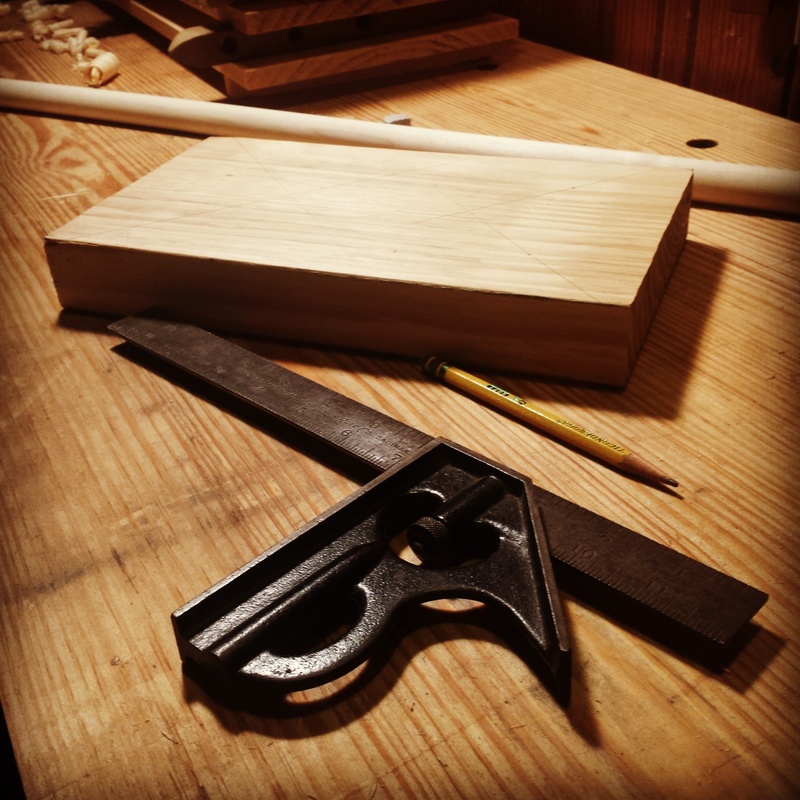 Once again your picture makes me re-thinking the construction of my kid’s workbench: My front vise is mounted on the left side, but not flush with the bench top (it is about 20″ set more to the middle). The distance makes is awkward to saw a stick (like your daughter does in the picture) because it swings too much. 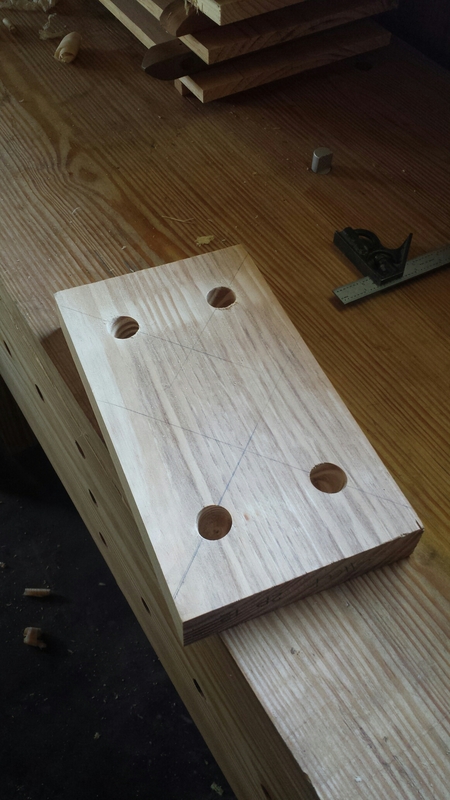 One option I see is to mount the vise flush, the other to train them kids using a bench hook (clamped in the vise). Looks like you guys had a wonderful time.